Microsoft officially unveiled Windows 10 this morning, and the company is planning to distribute a Technical Preview of the new operating system tomorrow. At Microsoft’s event today there were a number of machines running the Windows 10 Technical Preview, and I got an opportunity to briefly explore the new OS. While Microsoft pushed hard with touch on Windows 8, Windows 10 is the complete opposite. If you mouse into the corners to find the tricky Charms Bar they no longer trigger and frustrate. Instead, you’re greeted with the familiar Windows desktop and Start Menu from the moment you use Windows 10. It’s Windows 7 right now and very early in its development, but it has some interesting improvements waiting inside. The Start Menu is the most obvious addition. Just like in Windows 7 and other versions before it, the Start Menu largely acts in the same way. Microsoft has done a u-turn here, but it’s also considered the way it can modernize its Start Menu and it appears to have paid off. It’s customizable enough that you can resize it, pin traditional and modern apps, or simply have it match the color of your desktop wallpaper. These hints of Windows 8 shine through directly in the Windows 10 Start Menu, and although the overall interface feels like the Windows desktop, the Start Menu feels truly new and yet familiar at the same time. Another big new user interface feature is a new Task View button that sits on the taskbar. It looks fairly innocuous, but when you trigger it you’re thrown into a multitasking view that’s very similar to Apple’s OS X Expose feature. Multiple desktops are available from here, and you can switch between them with ease to manage multiple apps across different workspaces. It’s the feature Windows has always needed, and Microsoft has borrowed elements from rival operating systems like OS X and Linux / Unix to really introduce this in Windows 10. But instead of making it identical to the competition, Microsoft has added in its productivity-focused snap views into Task View. You can snap apps in the same way you do in Windows 7 or Windows 8, and a new prompt will suggest apps that can be snapped alongside each other or windowed in complex ways. It appears to work well, even if there’s a slight learning curve you’ll need to get over to make the most out of it. I did notice that if you have apps running in a separate desktop space then it can get confusing to bring them to a different active desktop space, but this is an early build of Windows 10 and there’s a long way to go until it’s ready late next year. Elsewhere, there are hints that Microsoft will revamp the user interface more. 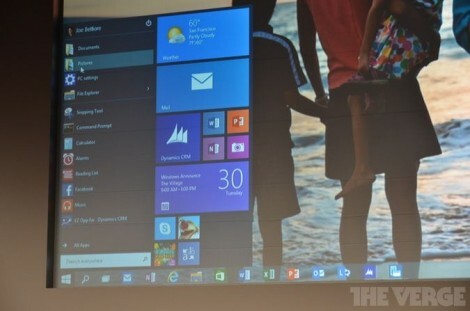 There’s subtle drop shadows around apps, and a new bar on the taskbar that indicates what apps are active. There’s also new icons for File Explorer and Desktop, but you can imagine that Microsoft will overhaul all of its icons to be more modern with Windows 10. Another big change is the ability to run universal modern apps in windows on the desktop. Microsoft demonstrated this originally at Build, but using it in practice just feels totally natural, as if it should have always been this way. You can snap these apps alongside each other, and they also seem to resize fairly well to make them a lot more usable for mouse and keyboard users. Windows 10 might be fairly basic right now, but the signs are there that Microsoft understands its audience of Windows users. Microsoft’s Joe Belfiore took the time to demonstrate a command prompt refresh that finally brings the ability to copy and paste directories with the keyboard. It’s the most minor and geeky feature you’d ever expect in a Microsoft keynote, but it demonstrates that the company appears to be serious about overhauling Windows fully with Windows 10. With regular updates planned over the coming months before release, expect to see Windows 10 change in unexpected and welcomed ways. It might look like Windows 10 is just another Windows 7, but hopefully once the company is done tidying up the Windows desktop it will look and feel like a lot more.